Here is how to make three million people wonder what the hell you are up to next. 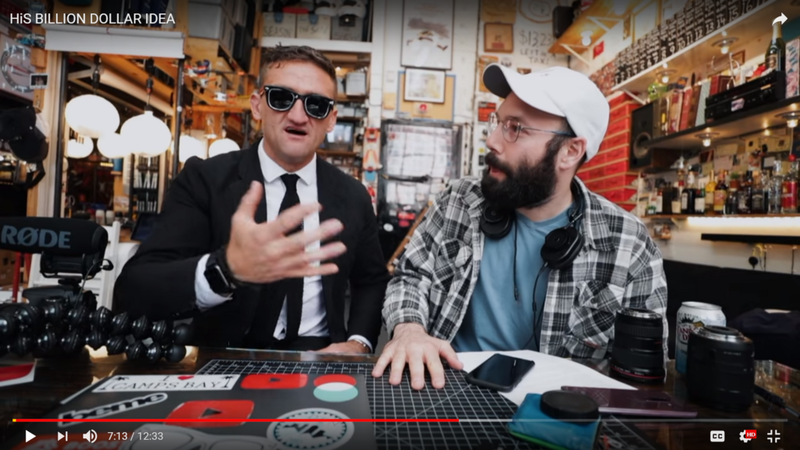 In case you haven’t heard about it yet — Jack Conte, CEO of Patreon, has pitched Casey Neistat a business idea via this video. This article will only make sense for you if you actually watch the pitch first. First, let’s get a little bit into the backstory. Casey is one of the most famous Youtubers, with more than 9 million subscribers. He is also the founder and former CEO of Beme — a multimedia company, which he sold to CNN for $25 million. Recently, Casey has announced the development of what he calls 368. It is a new form of a daily vlog, which is supposed to go beyond just himself. He wants to achieve that by renting a large space. He intends to use this space as a creative location that includes all sorts of stuff — video production studios, hangout places, a skate park, a shared kitchen, office rooms, and all sorts of other lifestyle options. His goal is to bring all sorts of creatives together, and to produce a daily vlog that features what is going on within that space. This is where Jack comes into play. So Jack Conte sees this video — and sees his opportunity. He makes this video in which he is showing off his impressive video editing skills — perhaps on par with Casey himself. He shows Casey that they share a similar background. Jack himself loved playing around with his camera since he was a teenager. He even takes us to his old home office, where he brings up all sorts of stuff that shows his long history as a creative. He keeps saying that he has this amazing idea of what to do with 368. But he doesn’t share anything about what that idea is. All he says is that he is going to buy a ticket to fly to New York, and that he will meet Casey there. As listeners, we can get a hunch for what his idea is all about. With Patreon being a platform that helps creatives monetise their work, it is relatively easy to see how the goals of the two businesses could align. But we don’t know what exactly Jack’s plan is. And this is what sparked the curiosity of 1.5 million people watching the video, many of whom were begging Casey to accept Jack’s offer. Next thing we know is that Casey uploads a video which features the two of them together. Although the title of that video is “HIS BILLION DOLLAR IDEA”, we still learn nothing about what this idea really is. We only get to see how the two of them explore the space together. We also see them discuss Jack’s pitch on a very basic level. Finally, the only thing we learn from this video is that the two of them reach some sort of agreement. But what exactly that is, we still don’t know. What made Jack’s plan so incredibly powerful? Both of them were successful. Not only did he reach Casey, but he also reached about 3 million people, if you combine the views on both of their channels. As a little bonus, his Youtube channel went from like 11,000- to 70,000 subscribers within a week. He did it by making it incredibly personal. By talking about his childhood — and teenage experience of film making, and showing what motivated him to start his company. He did it by showing how Casey’s and his own mission were in alignment. By showing that both of them were interested in doing collaborative work with smaller creators, and supporting them. He did it by using an element of surprise. Who would’ve thought that the CEO of an exciting start-up like Patreon, is also a musician, and a filmmaker who has incredible video editing skills? He did it by making you curious about what his idea really was. He constantly kept talking about this idea, giving a lot of context, but not saying a word about what this idea really was. He leaves it open. He did it by making something that people usually don’t get to see, a public thing. Two highly successful people interacting with one another and doing business — that is something that is usually done privately. He did it by bringing an element of fun into it. There is this scene where he is basically talking with another version of himself — in the editing software. He did it by mobilising his existing audience to achieve his goals. There were so many people asking Casey to agree, that he basically couldn’t have said no, even if he wanted to. He did it by showing Casey that there is something in it for him, too. Not only would this give Casey interesting content, but also the opportunity to collaborate with an exciting company that operates in the creative sphere. He did it because he got the timing perfectly right. Casey isn’t 100% sure yet where 368 is really going, so he was open for opportunities and input from external sources. This pitch of Jack Conte was a rare opportunity for us to get an insight into the business minds of two highly successful people. Jack saw Casey’s video about the early stages of 368, and jumped on the opportunity right away. Looking at the amount of editing done, the production of that video took a hell a lot of time. And yet, its results speak for themselves. Even if nothing else comes out of their meeting, it has helped Patreon to get exposed to a total audience of about 3 million people. And they are not any kind of people — many of them are a perfect fit for Patreon’s target audience. If you haven’t watched both videos already — I highly recommend you to do so. They are the perfect real world examples of content marketing done at its best. There wasn’t anything particularly special or sophisticated about it. It was a simple video, that had a powerful emotional effect on its intended audience. So powerful, that more than 7000 people took action via the comment section. Emotional impact is the key. Not fancy marketing tactics or resources. If you found this article useful please do ? and to share it with your friends. Remember, you can clap up to 50 times — it really makes a big difference for me. You can also subscribe to my free newsletter by clicking here. Follow us on Twitter. Join our Facebook Group. We are sponsored by LeadFuze, which aims to kill the cold call. Spend your time with qualified prospects who actually have interest in what you sell thanks to LeadFuze’s automated sales prospecting and engagement platform. Learn how to stop wasting time on cold calls and emails with LeadFuze. If you enjoyed this story, please recommend ? and share to help others find it! This was one hell of a pitch was originally published in Marketing And Growth Hacking on Medium, where people are continuing the conversation by highlighting and responding to this story. Biz Tips: So, You Think Your Industry is Too Boring to Blog About?